Schlepping to the office five days a week is enough to make employees, or would be employees, reconsider working for you. This is particularly true in urban areas, where 20 miles might equal an hour commute. Or in growing families, where daycare costs might eat their pay check. In comes telecommuting. And in an era of high competition for top-notch employees, even stick in-the-mud old schoolers have to consider telecommuting as an option for employees. Currently, there are an estimated 3.9 million telecommuters in the US. Up 115% from 2005. Jane has a 20 mile commute and bears a high proportion of parental duties, and works two days a week from home. Seems fair. John, her coworker performing in a similar job, is denied telecommuting. John doesn't have parental responsibilities. His commute is about the same as Jane. Mana from heaven for discrimination lawyers. So you give in to John so he doesn't call the law offices of Duey, Cheatem, and Howe. You give him a laptop and set him up at home. Later, you have to reprimand John for his lack of availability while working from home. He promptly quits. And has your laptop. With your customers' information on it. Safely in John's spare bedroom, where he now uses it to play Grand Theft Auto (GFA). Imagine that disclosure to your customers? "Your personal information may have been compromised to a Missouri teen that achieved Level 20 on Grand Theft Auto and somehow gained access to one of our laptops in the possession of a former disgruntled employee that was playing GFA with the alleged data thief." So what should you do? I have ideas. Most came from the ABA Banking Journal's thought provoking podcast: How to Make Telework Work in a Bank. 1. Have a policy. In order to avoid discrimination and missing half of your department, develop a policy that all telecommuting decisions are made from. For example, the policy may read "after two years of continuous employment, a manager may grant permission for an employee to work from home either temporarily or on some routine schedule, depending on the circumstances." And then spell out the decision map that the manager must follow. Like exceptions to loan policy, there may be exceptions to this policy. Such as waiving the two-year requirement for competitive reasons (if the new employee had telecommuting as part of their prior employers benefits). But have as specific a policy as possible to make it clear when telecommuting is permissible to minimize gray areas, discrimination, employee envy, and dissatisfaction. 2. Use Virtual Desktops. Solutions such as Citrix or Horizon transforms static desktops into secure, digital workspaces that can be delivered on demand. Meaning a telecommuter can use a VDI app to access their at-work desktop as if they were actually at work. And since the VDI is only delivering images of their desktop, data is not stored on the computer in their home. This solves for systems security and patching. And if the employee leaves, like our doppelganger John above, no worries. Access can be turned off from HQ. 3. Set expectations clearly. The ABA podcast suggested signing a contract with the employee. Such as ensuring they work a regular workday, instead of setting their own hours. You don't want branch staff calling a telecommuting employee for an IRA minimum required distribution amount and that person be out food shopping because the crowds are lighter at the supermarket mid afternoon. And be clear on days in the office versus working from home. Even if the telecommuting contract is short term, such as an employee recouping from a broken femur suffered while skiing. 4. Use office chat software. Such as HipChat or Slack. You may not have the "shout over the cubicle" capability with the telecommuter, but you can almost have it with an office chat application. They are getting such wide acceptance, they are being used instead of shouting over the cubicle. So why not take advantage of technology? 5. Use video to include telecommuters in meetings. 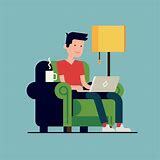 A risk of telecommuting is that this valuable employee, that you thought so valuable that you allow to work from home, would be disconnected to the workforce. Phone calls are one thing. But doubling up on the connectivity with video will improve internal camaraderie and make at-work and telecommuting employees feel more connected. If it means they have to shower and get out of their pajamas, so be it. My millennial daughter recently asked an employer if she could telecommute a couple of days per week. The company said they were just implementing a new policy to accommodate that. So if you are a telecommuting resister, it's coming whether you like it or not. I hope you can use the above ideas to make it work. This article relates to my firm's Profit and Process Improvement and Management Advisory services. Click on the links to learn more. What Makes an Effective Community Banking Board?